The function of the veins is to carry blood to the heart. I don’t like body builders who are so overdeveloped you can see the veins in their bulging muscles. staff members with varying levels of experience. 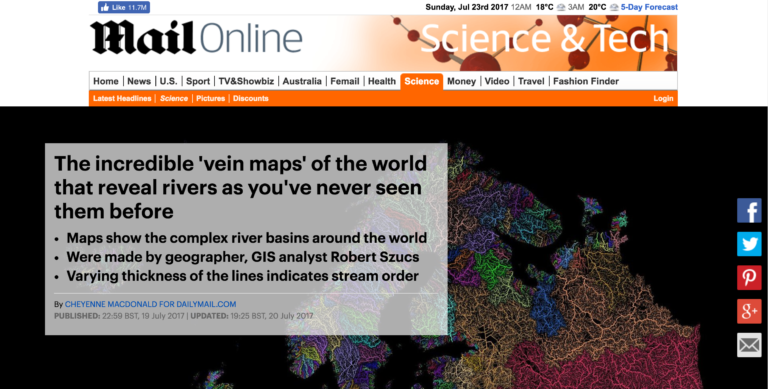 A series of colourful maps has revealed a breathtaking look at the vein-like network of river systems around the world, plotting the countless waterways that stretch across nearly every continent, from North America to Australia. Take a look at this picture and see if you recognize anyone. Can I have a look at your dictionary? He plotted a course between Hawaii and Tahiti. We plotted a course for one of the smaller islands. We‘ve plotted our projected costs for the coming year, and they show a big increase. 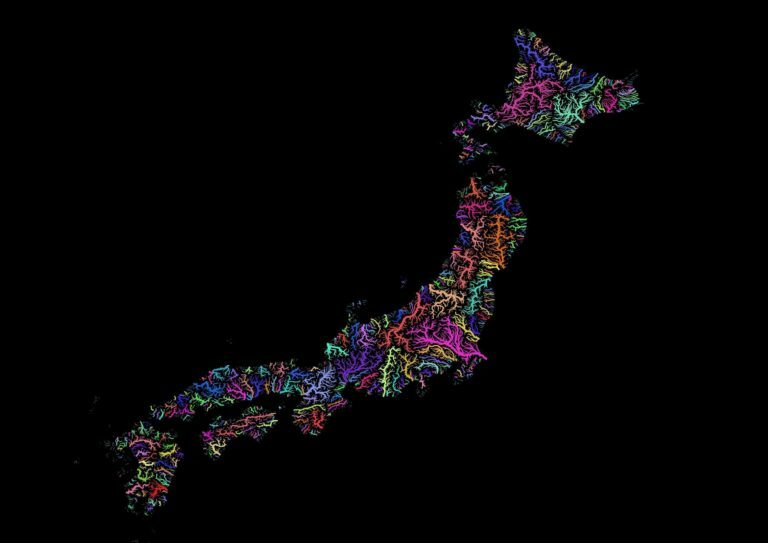 The maps, created by geographer and GIS analyst Robert Szucs, visualize permanent and temporary rivers and streams, using a rainbow of colours to differentiate the intricate branches. The watch mechanism is extremely intricate and very difficult to repair. 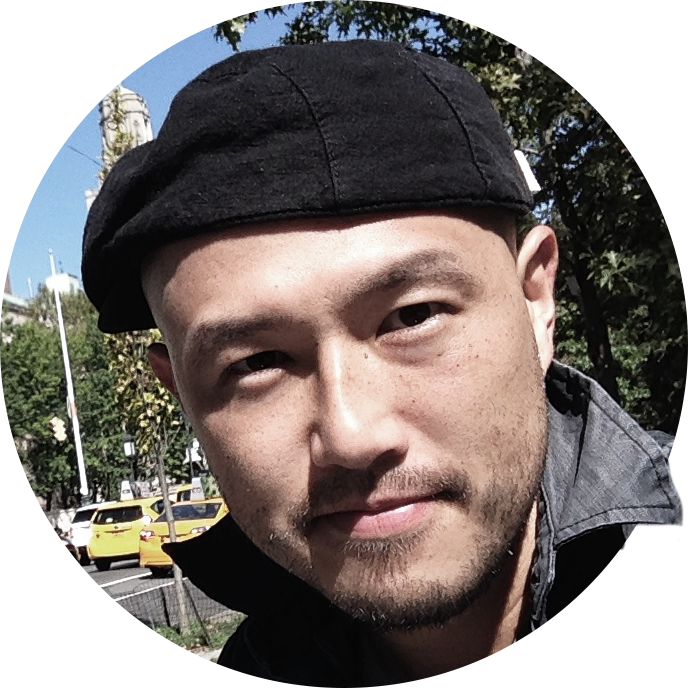 The novel’s intricate plot will not be easy to translate into a movie. Using a system known as Strahler Stream Order Classification, Szucs highlights the staggering breadth of Earth’s watersheds, with the individual flows involved in each particular basin shown as lines of varying thickness. The length of this box is twice its breadth. The discovery of penicillin was a watershed in the history of medicine. The year 1969 was a watershed in her life – she changed her career and remarried. 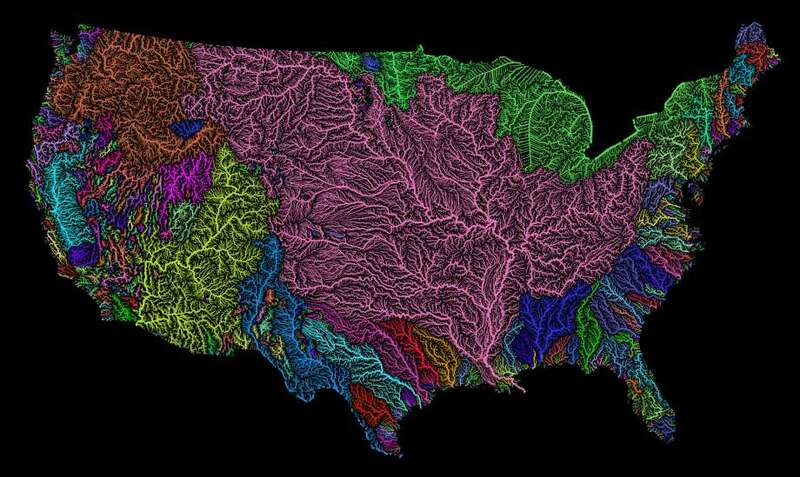 Szucs, who shares his work on Imgur under the name Fejetlenfej, has created stunning maps of the river basins all around the world, including those in the United States, Africa, South America, Australia and Japan. The work reflects a ‘lifelong passion for beautiful maps,’ combining scientific expertise with art to create maps that are both ‘informative and beautiful,’ Szucs explains on his website. I have no expertise in sewing. I have no sewing expertise. She has considerable expertise in French history. He recently updated his map of the United States, which reveals the massive expanse of river basins across the country – in particular, those which feed the Mississippi River. Several small streams feed into (= join) the river near here. Information is fed into the computer and stored in a database. The images are fed over satellite networks to broadcasters throughout the world. She married a man from the neighbouring village. The two states are contiguous with/to each other, but the laws are quite different. The earthquake once again dominated the news. Don’t allow the computer to dominate your child’s life. The dispute is likely to dominate the news. The black lettering really stands out on that orange background. Their old orange car stood out from all the rest. At the top of the map, the Souris-Red-Rainy Basin is illustrated in green. The river snakes through some of the most spectacular countryside in France. The queue for tickets snaked all the way around the block. People spent hours waiting in lines that snaked around the stadium to get tickets. The path snakes through the trees and up the hill.